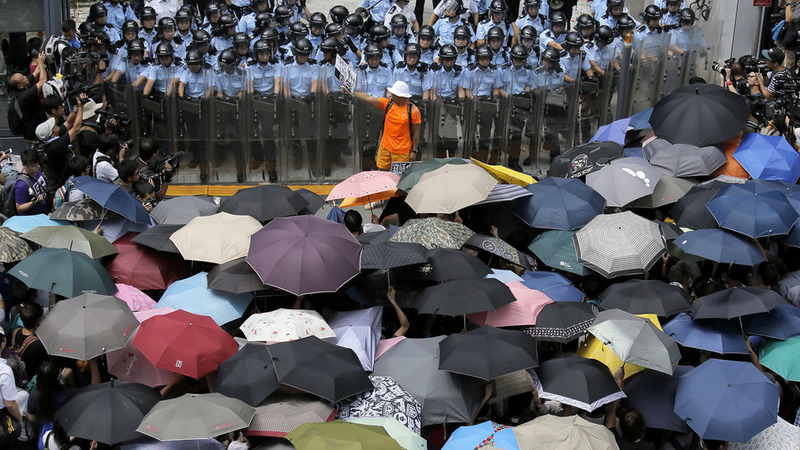 Protests in Hong Kong reached a dangerous head this week, as various citizens have confronted police forces with devastating new weapons of mass destruction. The organized forces in the streets have demonstrated a new and violent penchant for destruction by brandishing umbrellas when confronted with peacekeepers’ nonviolent attempts to contain the protest with cries to “desist” accompanied with tear gas. Hong Kong PD member Alex Lee spoke about his horrifying experiences in the wake of the uprising: “We were so vastly outnumbered…When the crowd began to pull out umbrellas, we could only keep up by peacefully throwing more canisters of gas.” Lee added in a later statement that despite being well-equipped, Hong Kong PD couldn’t withstand the onslaught of rain-stopping instruments and worried that they would soon start to use galoshes. In the wake of the confrontation, the government has hired expert negotiators from the local Triads to convince the demonstrators to stop. With advanced tactics to promote non-hostility like “escalating the protest to allow the government to legally take military action to contain it,” notable members of the Chinese government are confident that democracy will prevail soon. The likelihood of democracy may not be as high as the Chinese government predicts, however. When asked if they had plans to cease, the political dissidents intimated that they would escalate their rebellion by allowing trucks containing food and water to reach police officers.